Cupcake, my love: I'm A Believer! So I must admit when I saw this week's TWD recipe I was a little reluctant. I remember about a year ago when I bought Dorie's book I read through every page, as I'm sure most of us do. I was making notes of things that I thought I just couldn't live without, which of course was almost the entire book. 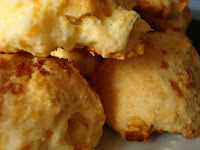 One of the few items that didn't make my expanding list were the Apple Cheddar Scones. I mean I like apples and cheese, but together in a scone just didn't sound right. 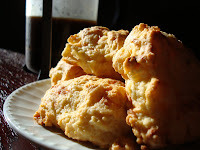 So I just completely skipped over that page without a second thought...until last week when I visited the amazing TWD webpage and saw that Karina of The Floured Apron picked this recipe. 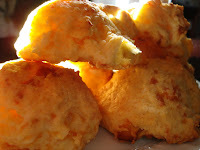 I of course am a batter taster, so the second I had the batter all prepared (which is my fav scone recipe, because they come together soo quickly) I had to stick my lightly sun kissed index finger into the golden yellow batter. Straight into the mouth and a slight turn of the head was my response. The batter tasted sweeter and better than what I had thought, but still not convinced I told myself that I wouldn't be swayed until I tasted the actual baked product. As the minutes on the timer ticked away, the most amazing, sweet, fruity aroma filled my apartment. My barrier against this recipe was slowly starting to deteriorate! 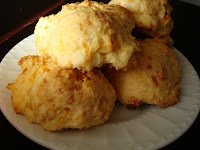 The second the timer went off I ran to the oven and pulled out these gorgeous, sunshine yellow with orange speckled scones. 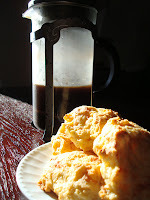 It was hard for me to let them cool before tasting them, but the minute I put them into my mouth and was able to process the flavor my barrier completely crumbled, leaving me standing there wanting another bite of these sweet scones. I think the combination of the sweet yellow corn meal, dried apples and apple juice really helped to mellow out the sharp cheese. So I must say thank you so much to Karina for widening my horizons and to try not to prejudge a recipe before I've tasted it. To see other TWD Blogger experiences check out the famous Tuesdays With Dorie Blog! I'm glad you're a believer in these. They look wonderful. Glad you likesd them...me? Not si much. But so glad we tried! I was all in the batter! Great job I am glad that you liked them! Isn't it funny how un-assuming the recipe seemed on paper? What a sneaky treasure! I'm so glad you liked them! Great job! I like batter too especially cookie dough! Your pictures are great! I'm so glad you tried them and even gladder (is that a word?) that you liked them. Glad we were able to convert you. Yum! Nothing like being converted to baked goods!